If Sambar powder comes, can Sambar be far behind? Here it is! 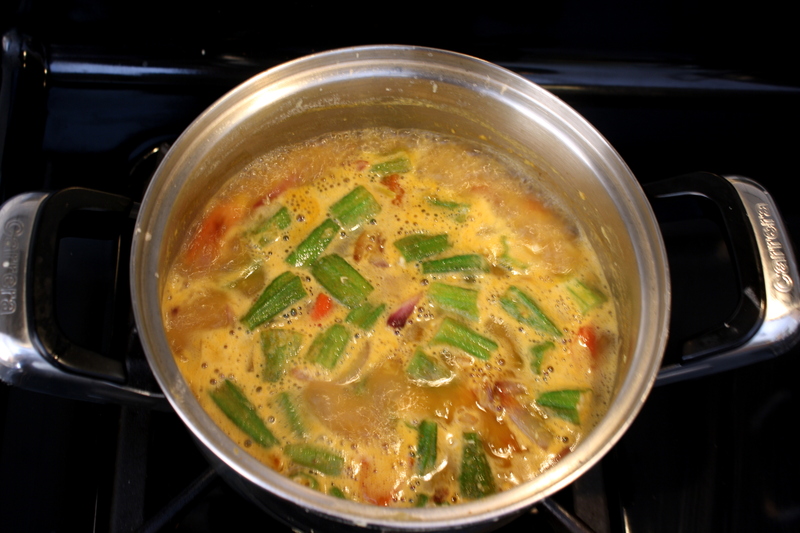 Sambar is next to rice, literally, in every household in South India. Many seasonal vegetables are used but drumstick, the long stick like vegetable from Moringa tree gives the best flavour. I make Sambar at least once a week. It is an accompaniment for all different dishes like Idly, dosa, vada, pongal, upma and steamed rice. My mother would serve it for breakfast, lunch and dinner. I wonder, how after ingesting so much of it, I have not grown tired of it! I have come a long way in making it, from my very first, horror inducing beetroot sambar to today’s okra sambar, there were many slips and falls. But the dish has definitely been polished to a higher level in my repetitions, that I can prepare it even sleepwalking. 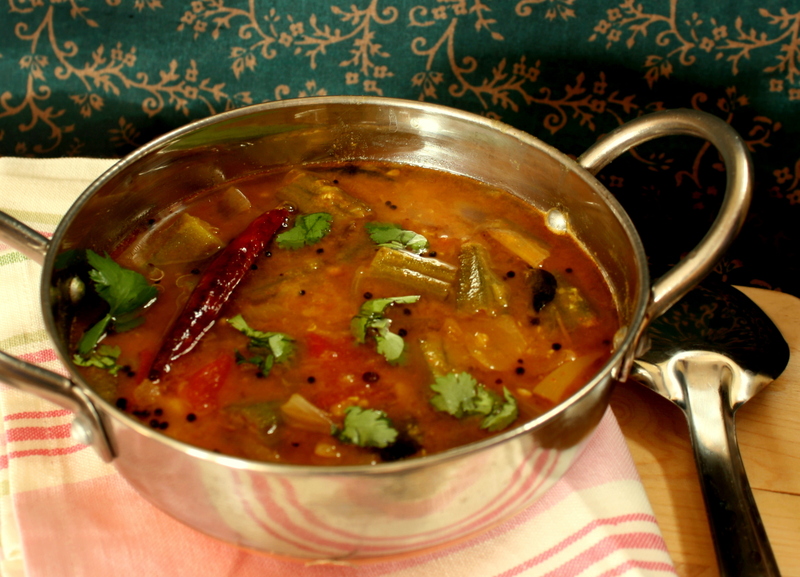 For vegetarian feasts and in restaurants the main side dish is undoubtedly our humble Sambar. I have a friend who pours it in a soup bowl and drinks it, cleaning her palette with bits of idly and releasing…Aaha! at intervals! Adding ghee on top of Sambar poured on hot steamed rice is what I dream of when on a long journey away from home. I would say, experience is the main ingredient to make an excellent Sambar. Isn’t it true for every little craft? Cook thur dhal in a pressure cooker adding water. Dissolve tamarind in some water. Slice onion and fry it in a little oil. 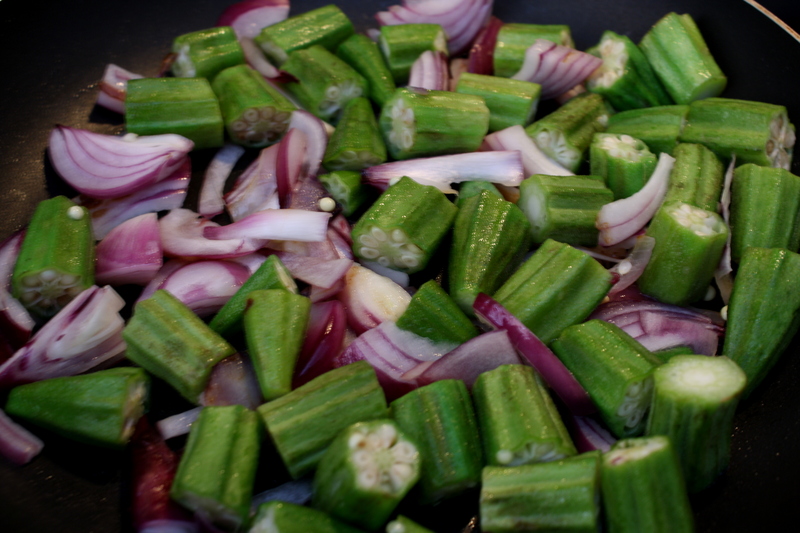 Chop okra into 1 inch pieces and fry it with onion slices. In a heavy bottom pan, boil tamarind juice until raw smell disappears and water reduces. Add mashed dhal and 1 cup water and boil. To this, add Sambar powder (Sambar powder recipe here) and mix well. Add fried onion and okra pieces. Boil well and add salt. Chop tomato into large pieces and add to the boiling curry. Allow the vegetables to cook. In another pan add oil and pop mustard. Add curry leaves and a red chillies to the pan and fry them. Pour this on top of the curry. Close the pan with a lid and allow all the flavours to merge into a superior goodness. My tongue is addicted to this spicy, tangy taste. As I cannot survive very long without this curry, I would call it the elixir of my life! I believe, most people in that part of the world cannot function without this lentil based curry. 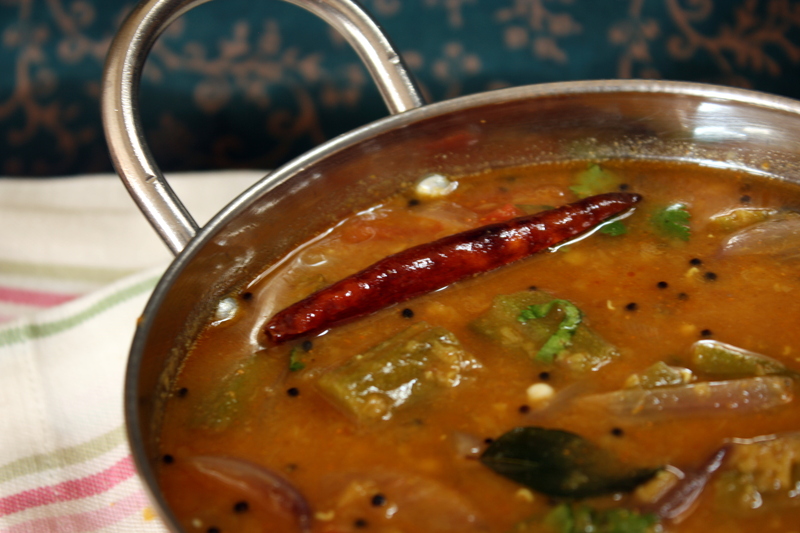 Let Sambar bask in its glory forever! This entry was posted in Curry, Side dish, Vegetarian and tagged Curry, lady's finger sambar, Okra sambar, sambar, Sambar powder, spicy lentil curry, vegetable curry, vegetarian curry, vendakkai sambar. Bookmark the permalink. Thank you for the support! Sambar is equal to Rajanikanth in Tamilnadu! Frying okra removes its slimy texture but okra still adds some bulk to the gravy. To be honest drumstick sambar is my favourite! I see that you put the fresh sambar podi to immediate use….. I so want hot sambar and rice right now! Alas, I am at work and have to wait till tomorrow. I was forced to try the powder to check the result. Am sure you have already made Sambar by now and enjoyed the bliss! That is the power of craving! I tried it religiously! Although this is a super easy dish, I guess, most vegetarians got their protein from the lentil in Sambar and so popular for its balmy heat.